The recordings in the W.R. Mitchell Archive vividly illustrate the changes in transport in the Yorkshire Dales and its impact. 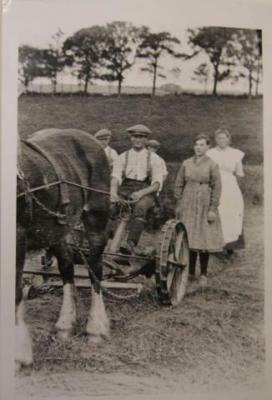 Transport was as essential to the Dales men and women of the early part of the 20th century as it is today. Some of the recordings document life in the late Victorian Dales when many workers simply walked to work. Henry Cox describes how, at the age of eleven, he and his mother walked over a mile from their home in Giggleswick to Langcliffe Mill every day - a round journey of three miles a day. Many of the memories of those interviewed by W.R. Mitchell, describe a community dependent on horses, carts, wagons and coaches in the inter-war years. Ann Margaret Mason vividly describes her attachment to the family horses used on the farm. These were working horses, Shire Horses, and used to pull carts, wagons and heavy farming equipment. They were an essential part of the Dales way of life. Other interviews stress the importance of the railway in moving livestock from auction marts to farms, and the vital role the railways played as a lifeline during the harsh winter of 1947, providing supplies when roads were impassable by foot or on horse. The advent of the bicycle, car and motorbike brought profound changes to the Dales. John Keavey describes early cycling clubs, trams and the railway connections of the early 1930s. Many interviewees describe their first cars, from Model T Fords to Alvis and Austin models.